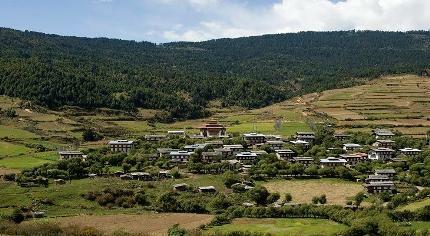 The district of the Bumthang is one of the richest and historically relevant districts of Bhutan. There are four main valleys of Bumthang namely Choekhor, Ura, Chumney and Tang and collectively they are known as Bumthang Valley. The word Bumthang means beautiful field and it is said that the most beautiful girls of Bhutan reside in these valleys. There are many farms in Bumthang producing cheese, apples, honey, potato, rice, buckwheat and other dairy products. You can avail either of these two options to reach Bumthang. You can either drive by road from Thimphu/ Paro (Thimphu being the more convenient option) to Wangdi Phodrang to Punakha to Trongsa and then to Bumthang or you can fly from Paro to Bumthang by air and land in Bathpalathang Airport in Jakar (1-hour flight). Tashi air operates flights daily from Bumthang to Paro and vice versa. There is a standard bus service that operates between Thimphu and Bumthang. You can also hire a luxury tour bus (if you are in a group of more than 30 people) or SUV or a car. It will take 8 to 12 hours to reach Bumthang from Thimphu depending upon the kind of road conveyance option and route you choose. The road route is the most preferred (the scenery is beautiful) and you can stop in Punakha for the night (or for a couple of hours) and then start off the next day. Stop frequently at many tea shops and go on an impromptu picnic at Chendebji Chorten and check out the museum and dzong at Trongsa. You can travel via Gangtey or Wangduephodrang using the below mentioned route stopping and exploring the following places. Please note that this is a long route (and not a direct one) and it covers all the principal areas of tourist interest between Thimphu and Bumthang. From Thimphu to Bumthang the distance is 271 km and the taxi fare is 4539 NU. From Trongsa to Bumthang the distance is 79 km and the taxi fare is 1400 NU. From Wangdue to Bumthang, the distance is 179 km and the taxi fare is 3349 NU. From the western border town of Phuntsheoling to Bumthang the distance is 426 km and the cab fare is 7242 NU. From the Southern Border town Gelephu to Bumthang, the distance is 380 km and the cab fare is 5504 NU. If you want to reach Bumthang from Phobjika then you have to cover distance of 163 km and the cab fare is 3021 NU. The distance between Punakha and Bumthang is 216 km and the taxi fare is 3988 NU, should you wish to approach Bumthang after touring Wangdue and Punakha. From Paro to bumthang the distance is 312 km while the cab fare is 5000 NU. When in Bumthang, try staying near Jakar (also called Chamkhar) as most good restaurants and shopping options are in here though the other small hamlets and villages offer quaint accommodation and dining options. Jakar is the biggest trade centres of this region and lies at the foothills of the Chokhor Valley. The Bathpalathang domestic airport is also situated near Jakar. Jakar is not as cold as the upper climes of Bumthang but it is very windy. This historically and spiritually relevant lake is situated along the road leading to the village of Tang in the Bumthang Valley. This lake is also known as Mebar Tsho and it is 30 minutes away from the town of Chamkhar. This lake is believed to be very sacred as it hides many treasures that were hidden here by Guru Rinpoche. It was Pema Lingpa who discovered some of these treasures in the 15th century. Strings of multi-coloured flags surround this region and there is an altar dedicated to Pema Lingpa. People keep offering butter lamps at the lake and at night the lake glows with a rare celestial beauty. The Ogyen Choling museum is situated in a huge manor in Tang region in Jakar that has been occupied by the same family for 23 generations. In fact, the present curator in Kunzang Choden is the direct descendant of the same family. There are extensive displays of costumes, royal tools and rooms filled with intricately designed furniture on display. You need to drive through a somewhat uneven road to reach the museum on Tang Valley. The curator will provide valuable insight into the history and culture of the family. This 1857 built palace in Jakar is presently being renovated by the government of Bhutan and is the historical home of the first king of Bhutan. This can be a good option if you have time left over on your Bumthang trip. The palace is quite near the Bumthang airport and there is smallish temple inside the palace complex. Right now, monks reside in the palace and there are beautiful rice fields all around. Kurjey Lhakhang derives inspiration from the kur (body) and the jey (print) of Guru Rinpoche and they are preserved inside a cave nestled in one of the most ancient buildings in the temple complex. The Guru Lhakhang is the oldest temple (built in 1652 by Mingyur Tenpa) and it contains the famous illustration of snow lion fighting with Garuda. The ground floor has a narrow passage through which you can crawl and see three Buddhas. The upper floor has 1000 statues of Guru Rinpoche along with Tara and Pema Lingpa. The second temple Sampa Lhakhang (built by first Bhutan king in 1900) houses paintings of four Guardians and a white ghostly Shelgig Kharpo along with Yakdu Nagpo and Kyebu Lungten. The third temple (built by wife of third king in 1984) has the wheel of life, mystical spiral mandala and several murals. The remains of the first 3 kings of Bhutan lie here. This is an elaborately made temple that is just 15 minutes away from Kurjey Lhakhang. There is an interesting 3D image of Guru Rinpoche and a beautiful painting of Mural of Ashi Wangchuk enjoying life in paradise. The ground floor has a very pretty chorten that’s called tashi gomang. About 5 minutes away are the springs of Kurjey Drupcchu which is a holy spring. this dzong (built I 1667 by Zhabdrungs grandfather Ngagi Wangchuk) overlooks the Chokhor valley and celebrates the victory of troops of Bhutan troops over Phuntsho Namgyal. this is one of those rare dzongs that cannot be circumbulated. The name Jakar Dzong means castle of a white bird and it underlines the fact that a huge white bird flew over a hill denoting the site of the monastery. 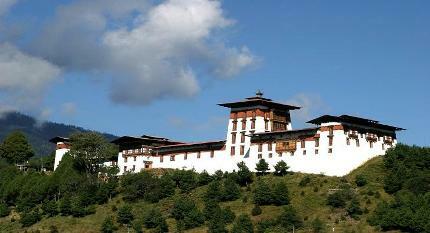 The dzong contains administrative offices, temple, watch tower and monk’s chambers. one of the oldest temples in Bhutan, this was built in 7th century along with 107 other temples. The temple has been visited several times by Guru Rinpoche and added structures have been added by Chakhar Gyab (king of Bumthang). Inside there is the Kala Chakra denoting the cyclical nature of time. There are relics of Jowo Jampa, future Buddha and 100 statues of Kalachakra deities. This temple is very close to the Kurjey Lhakhang and is a ten-minute drive from Chamkhar town. This is one of the oldest religious structures in Bhutan and has very ancient wall paintings. Built in 1501 by Pema Lingpa this monastery is preferred by scholars, theologists and followers of Buddhism for its direct connection to the heart of Buddhism. Singtrul Rinpoche (present incarnation of Pema Lingpa) presides over this monastery which has 95 monks staying in it. This is also a world heritage site as both the temples complex and Vihara are slowly moving towards ruin. This is sort of a must visit in Bumthang and you will be fascinated by the thorough demonstration of all the stages in brewing along with bottling, labeling (you can even participate in the process) that the brew master will happily provide. Its owned by Mr Maurer (he is a Swiss national) and he brews top notch unfiltered Weiss beer. This brewery doesn’t brew everyday so you/ tour arranger must call prior to your intended visit and confirm. The beer (complimentary red panda) is unfiltered with yeast floating in the bottle making it a unique experience. If you are lucky you will be given home fried crisps to go with your drink. If you are not a beer drinker…try the Apple Cider and Wine as they are really tasty. This is owned and managed by the same man (Fritz Maurer) who manages the Red Panda brewery. He produces Gouda and Emmenthal cheese and they are collectively known as Bumthang cheese. The Cheese Factory sands amidst a little farm which also produces clover honey and apple brandy too. You can also witness the different stages of cheese making and look at the advanced cheese making machines. This is a good place to check out and buy exotic varieties of cheese. You can opt to go on long drives from Bumthang to visit these passes (it will take you 4 hours to reach). Tang Valley is one of the 4 valleys of the Bumthang district and lately it has started gaining a lot of tourist attention for its virgin beauty and lovely trekking trails. From Jakar you need to follow an 11-km road till you reach the Tang Valley. The road will reach Membartsho and then the Pema Teckchok Nunnery before the site for Kunzangdrak hike is reached. Further on you will also see a beautiful Buddhist school at Mesithang and then the Tang Rimochen Lhakhang. There is an 8-roomed lovely river retreat called the Mesithang River Retreat at this spot and you can consider staying here if you want to experience the beauty of Central rural Bhutan in perfect comfort. The Tang Rimochen Lhakhang is the major attraction of Tang Valley and it is here that holy Padmasambhava meditated with his consorts Yeshe Tsogyal and Mandarava. The temple name Tang (and the valley name) is associated with large tiger stripes which can be seen on the rocks in front of the temple. The Padmasambhava pond, male and female Garuda rocks are the other points of interest. You can opt to hike up to the Ogyen Choeling House that is 45 minutes away by foot. The house has been maintained by more than ten generations who strove to preserve the sanctity of the Buddhist treasures that are stored inside. Local people respectfully refer to the house as a Dzong. Another major attraction in Tang Valley is the Ogyen Chholing Museum that is 22 km away from the Kizum Bridge. The museum stocks many beautiful artefacts and cultural specimens of Bhutan’s glorious past. Bhutan’s prominent spiritual icon Longchempa built the Ugyen Choling Estate Museum in 1300 and his descendants are credited spreading the Nyingma teachings all across Bhutan. Interestingly, trout fishes abound in the Tang Chhu river that flows through the Tang Valley but rules about fishing are quite strict in Bhutan. Ura is one of the most famous villages in Bumthang district and it has a distinctly medieval look about it. Interestingly, the women of Ura wear a very furry sheepskin shawl in winters that also doubles up as a blanket and cushion. The 9-km long Ura Geyzamchu Walking trail (covering Ura village) is very famous and this 5 hour hike will involve crossing the famous Wangthang La Pass and hiking along the Geyzam Chu. Rhododendron, wildflower and pine forests abound in Ura Valley. The Ura village is at an altitude of 3100 meters which makes it the highest altitude village in Bhutan. Ura is actually on a high plateau (rare in Bhutan) and you will get gorgeous views of Bhutan’s highest mountains from here if the weather is clear. The Ura Lhakhang is the prominent attraction of the Ura Valley and every year the famous Ura Tsechu is held in the month of May. The Ura Yakchoe dance is famous all over Bhutan for its beauty and fluidic movements. As you walk through the village, you will notice large herds of Yaks and sheep... the people living in this valley are mostly herders. Do visit the READ library if you happen to visit Ura. This is one of the few Bhutanese community Library chains that exist in Bhutan. There is a computer lab inside along with a rich collection of books for kids, adults etc. there is also an indoor games hub. Sometimes the director of famous art galleries in Bhutan come to the READ library to conduct workshops for kids. Creative writing workshops and reading classes are also held here.